​Bugs and flying insects can strike any time of the day and in any corner of your house, inside or out. From their annoying buzzing to the scary thought of insect bites, it is an immediate concern for every household to get rid of them as quick as possible. There is a continuous search for ways and means to eliminate insects within and surrounding our homes. There are insect sprays to immediately repel and kill insects but the effect doesn’t last long. There are also pest control services that offer a longer protection against pesky insects and bugs but can cost you a couple of hundred dollars. But there are products that can serve the same purpose of freeing your homes from pests without the use of chemicals and without the downtime. Bug zapper or bug zapper lights are easy and accessible equipment to help you get rid of insects within a specific range. Most bug zappers can be plugged directly to a power source and it instantaneously works to attract, trap and kill flying insects. There are indoor, outdoor, waterproof and portable versions on these zappers. ​This indoor bug zapper attracts insects by emitting an irresistible light wavelength of 365nm. 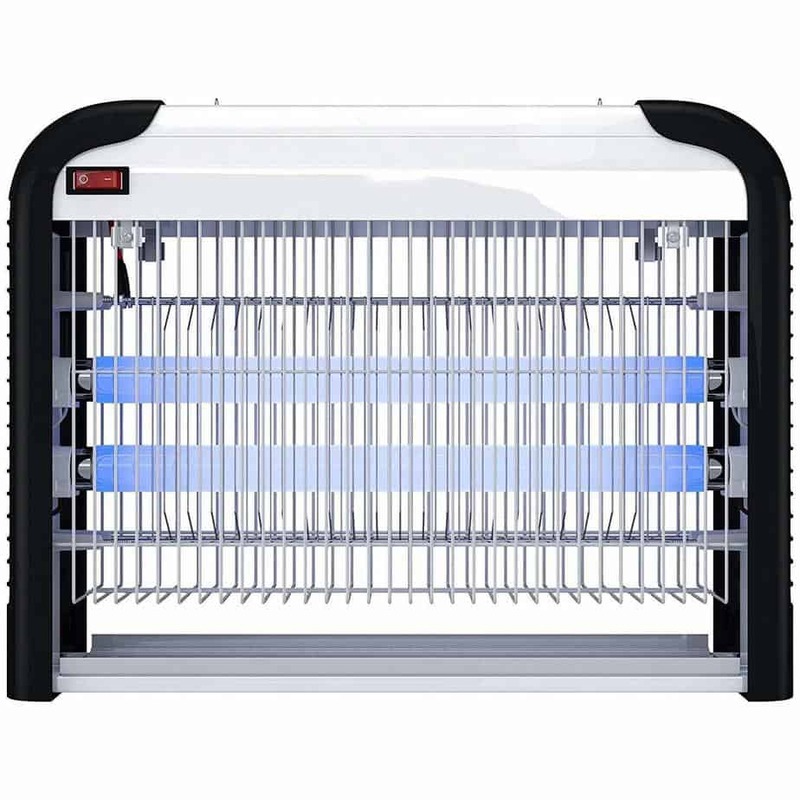 Dubbed as the “strongest insect zapper” in the market today, LiBa Bug Zapper is proven to wipe out the flying insects that come near it. It is guaranteed chemical-free and mess-free. It has a removable collection tray for easy disposal of dead insects. This is suitable for home and commercial use without the downtime from chemical pest control treatments. It also has a wide 2800V grid and covers a wider range of insect-zapping. It can be used as a counter-top zapper, placed on the floor or hung on the ceiling. This package comes with two (2) free replacement bulbs. Together with 4 to 5-star reviews on Amazon, the company also offers a 36-month warranty and a 90-day full refund once you are not satisfied with your purchase. 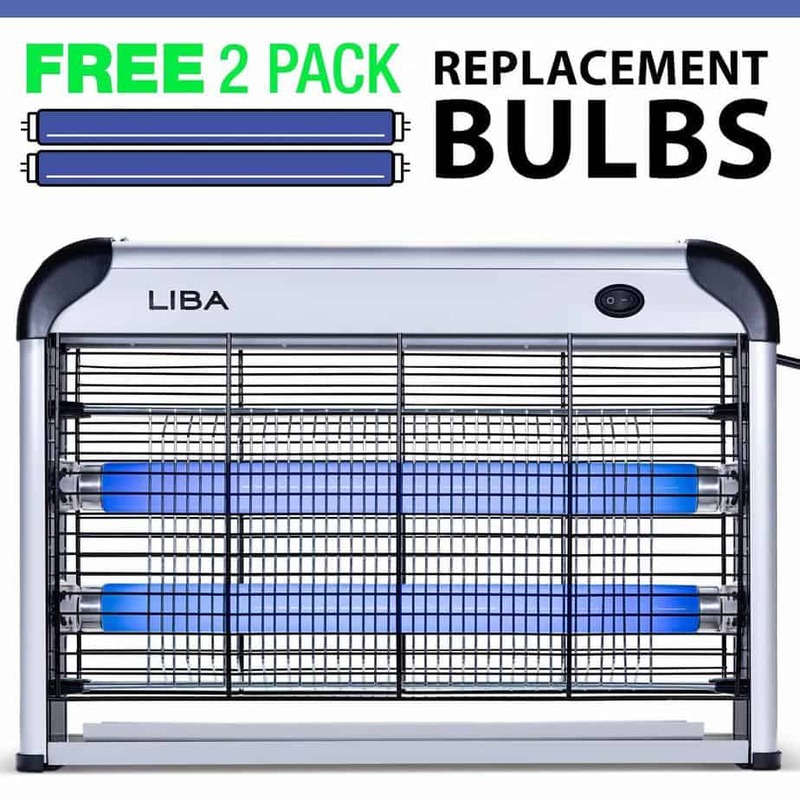 Although at a little higher price point compared with other brands, LiBa Electric Zapper is worth considering for all the positive traits it possesses. It obviously won the approval of thousands of users and it might just win yours too. ​From the name itself, you will know it is ready to avenge your home against pesky insects. It can cover as big as 6,000 sq. ft. of space and suitable for home, commercial and industrial use. It can also be used outdoors as long as it will remain dry and will not be rained on. The electrocuting grids are covered with another layer of metal grids to prevent accidental contact. It comes with detachable chains that make the zapper hanging and transfer-ready. PestZilla seems like an insect zapping giant with an average price point. You must prepare yourself as the zapping can get loud but that’s a good sign that it really works and kills bugs and other insects. ​This indoor bug zapper is just too honest and straightforward with its product features. Its equipped with two eco-bulbs that emit ultraviolet light that is safe for human eyes. It can be used as a stand bug zapper or you can opt to hang it on the wall or by the door. The brand also ensures no overheating for prolonged use and comes with a heavy duty core and plug. 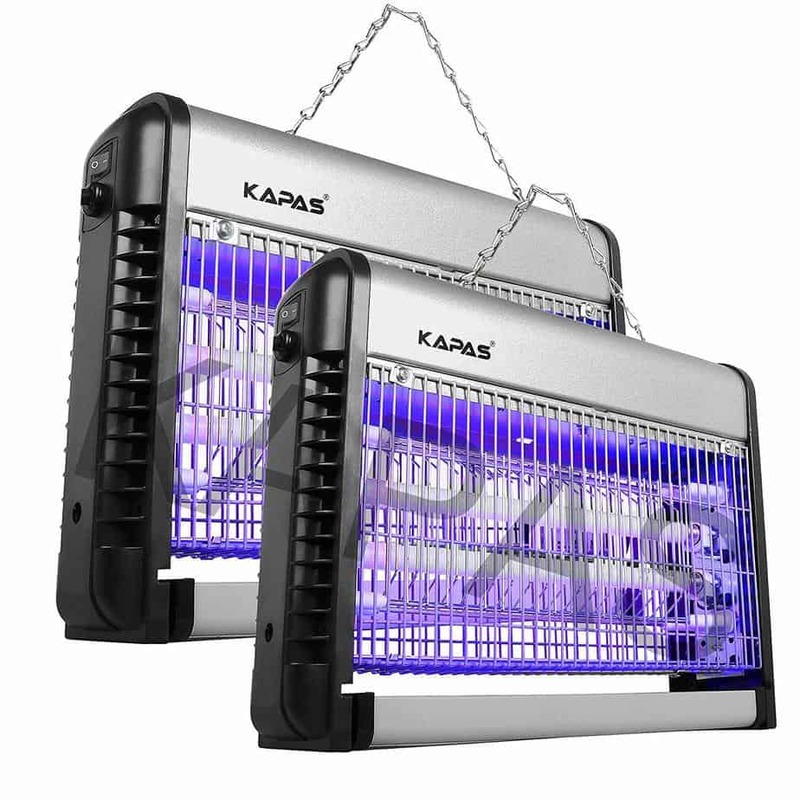 Kapas Indoor Bug Zapper offers a 3-year limited warranty and comes with a 2-unit bundle on Amazon which costs you less than buying two separate units. Kapas, although only suitable indoors, is very promising and the 3-year limited warranty is re-assuring of the quality. It is made in China and designed in the USA and uses high-quality materials. It is a wise buy for its price especially if you get the bundle deal. 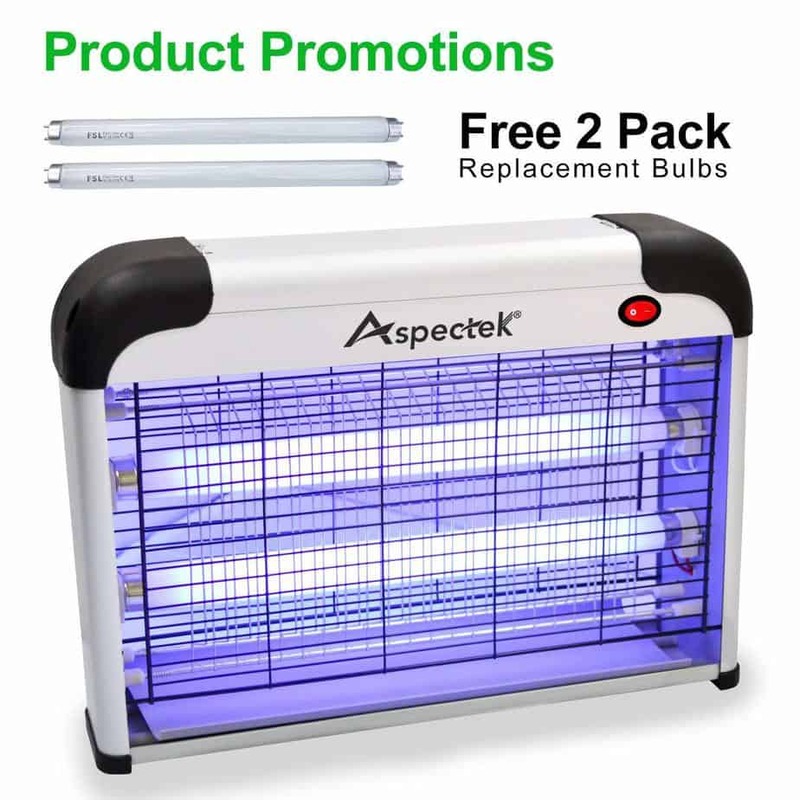 ​Backed by a very good reputation as the “longest-selling indoor bug zapper”, Aspectek Electronic Insect Killer is also longer and taller than its competitors in the same category at 15”x10” size. It has a mesh screen that keeps you, your kids and your pets from accidental zapping. The standard package comes with two UV light bulbs but it is also offered at a bundle with two more additional light bulbs. It is ready for hanging or as a standing bug zapper for indoor use. User reviews say that it is as effective as the Aspectek Electronic Bug Zapper that they had way back in the 90s. And that says a lot about the brand’s quality and reputation. From a long withstanding brand of electric bug zappers, this revamped and an improved variant is appealing to both old and new users of Aspectek. Although some users say the bulbs only last for a year, getting a bundle can support heavy use. ​Flowtron is a brand that offers a wide array of electronic zapper that predominantly looks like a bug zapper light. Most designs are lantern type and are for outdoor use only. This variant, Flowtron BK-15D is offered standalone or as an insect killer with attractant bundle. The bundle comes with Octenol mosquito attractant cartridges that drive insects towards the zapper for an increased kill rate. It can cover up to a ½ acre outdoor space. Users are advised to keep a distance of at least 25-feet from the zapper to avoid accidents in case there are too many insects lured by the zapper during use. ​Flowtron also comes with a variant to cover up to 1 acre. The initial package comes with a 30-day Octenol attractant cartridge to jumpstart insect zapping by luring insects and bugs to the equipment. Both Flowtron BK-15D and BK40-D are housed in durable and rust-proof polycarbonate lamp frame. A trusted name makes it easier to decide to get these products. However, it is only suitable for outdoors and lacks the versatility to be used indoors. The universality of the lamp design makes it an attractive piece for your balcony or patio, so it might as well stay outdoors. ​Under the Flowtron brand is yet another powerful bug zapper. 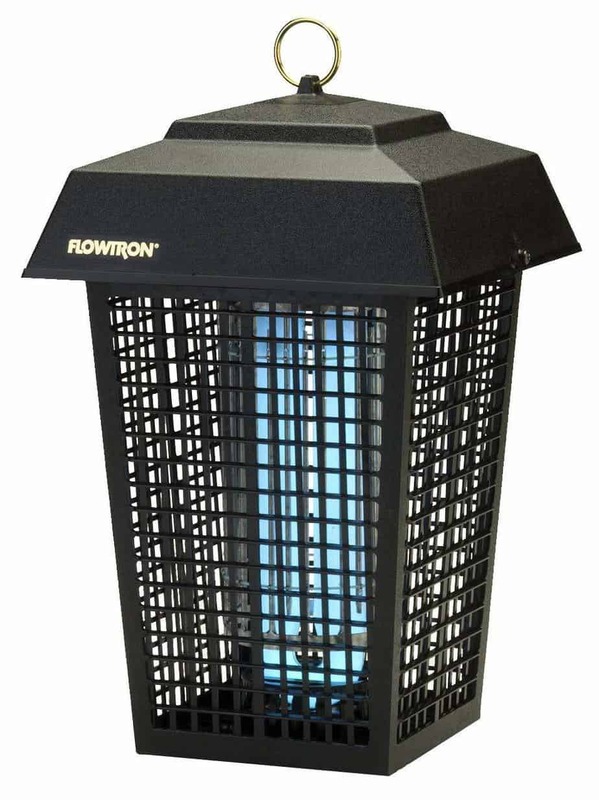 Flowtron FC-8800 Diplomat is a tall, large, indoor and outdoor insect zapper that is equipped with brighter light and more powerful electrocution for insects. Unlike other Flowtron models, this has a more straightforward design and the zapping grills do not have any cover. Users are advised to avoid touching while it is plugged. It is often marketed as the best insect zapper for farms because of its size and power. This is best for those who want to step up their insect-zapping game. Users can attest that whether it is for a farm, commercial, or home use, it is going to deliver great results. Its size and power make it a best-seller not just for home use but for farms as well. It may be on the high price point, but its sturdy built, coverage and zapping power makes it a worthy investment. 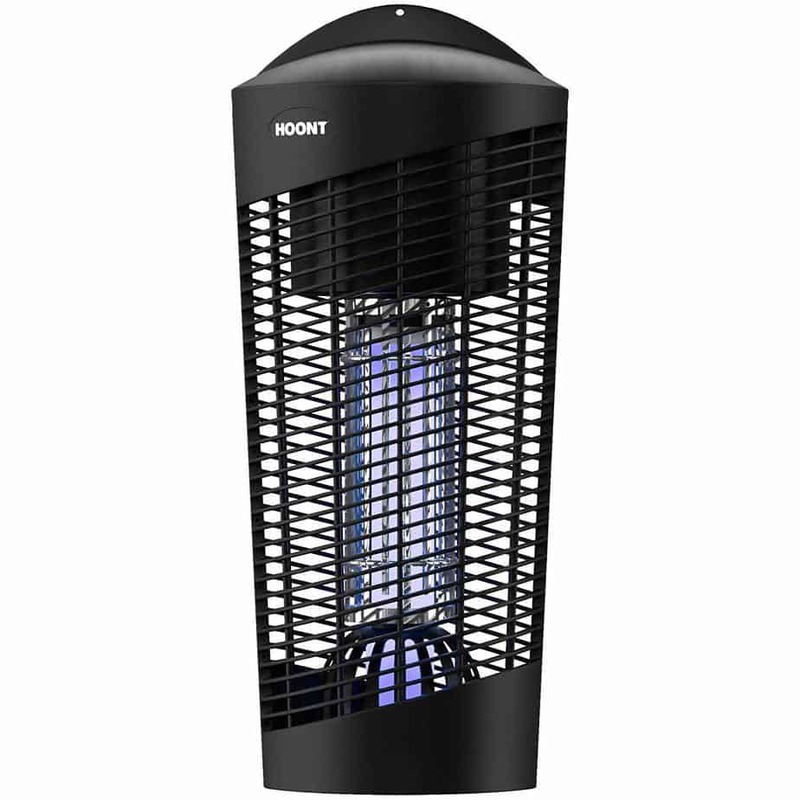 ​This bug zapper is built for some serious insect killing with the brand’s tagline: #hoontthemedown. This upgraded version for this insect zapper can cover up to 6,000 sq. ft. of the affected area. This is designed to attract insects using its ultraviolet light. It traps them inside a plastic grid and zaps them in the next layer of the electric zapper. It comes with a removable tray that catches all the insects for easy cleanup and a detachable chain for convenient transfer. This zapper lines itself together with the heavy duty zappers because of its size and coverage. However, the design of this new upgrade might be a downside. On the other hand, the affordability of the brand and good reviews should be enough to convince to buying one or two. ​If you are looking for an insect zapper you can bring out with you for late night barbecues or afternoon picnics, Stinger Cordless Rechargeable Insect Zapper is the best option for you. Its portability gives you access to it wherever you might be. It runs on a rechargeable lithium-ion battery that works up to 3.5 hours. The package comes with Octenol mosquito lure for outdoor use. However, it is highly recommended that you keep it at 10 to 14 feet away from human activity when in use. This is to avoid causing harm to you and your family once it starts luring insects. Zappers work best by attracting insects visually or luring them using scent before killing them. However, will 3.5 hours of working time be enough to do all of these? Outdoor activities might expose you to more insects than expected, having a rechargeable and portable zapper like this is necessary. As for the battery life, get extra rechargeable batteries to keep it running longer. This electric zapper serves the purpose of providing light and eliminating insects. It is a 2-in-1 light bulb and zapper which you can use at the same time or as a light bulb only. It is a 12W energy-saving LED light that you can use in any covered area of the house. Getting a bug zapper that works both on its utility and aesthetic functions is an interesting find. Light bulb bug zappers are becoming a trend in this category and can be a good addition to your home. It’s eco-friendly and perfect for the budget conscious buyers. ​If you love the outdoors but insect repellent lotions and sprays don’t seem to work, worry no more. 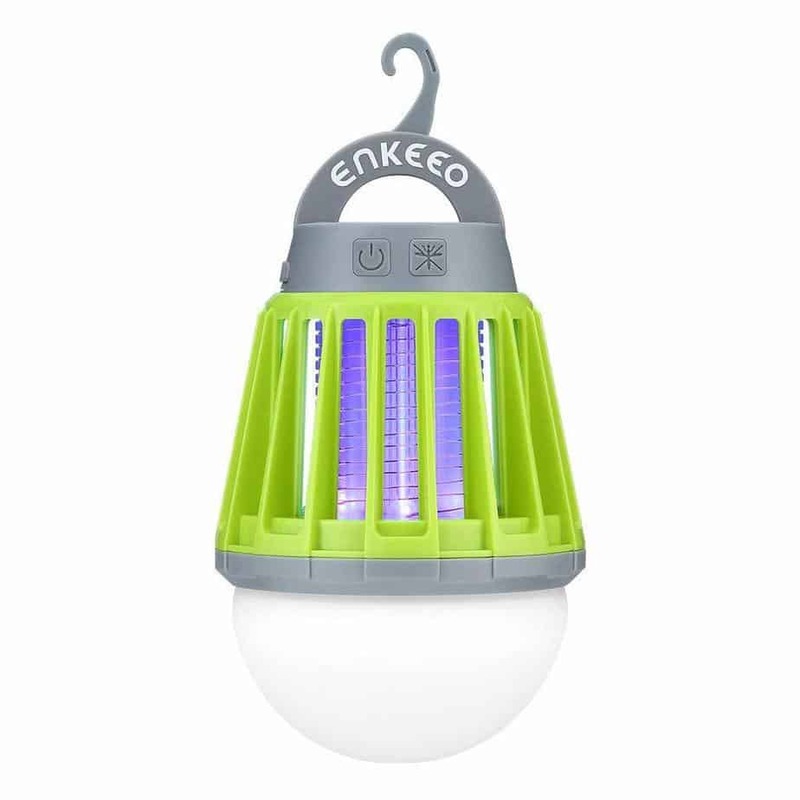 Enkeeo 2-in-1 camping lantern is a bug zapper and tent light in one. It’s a must-have for everyone since it can be used during emergencies too. It is portable, rechargeable, waterproof and adjustable. You can put it outside or inside of your tent for optimum protection. In can also be used as a table-top zapper at home and in your office as it’s USB-powered. It makes cleaning easy as you can simply put it under running water. You will need a portable bug zapper in one way or another. With great reviews to back this brand up, this zapper is a keeper. 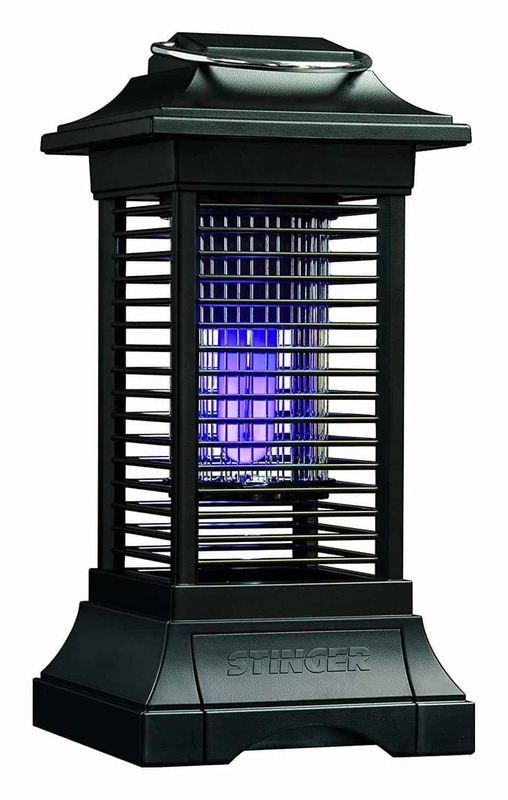 ​Here’s another interesting bug zapper that can elevate the aesthetic appeal of your garden. 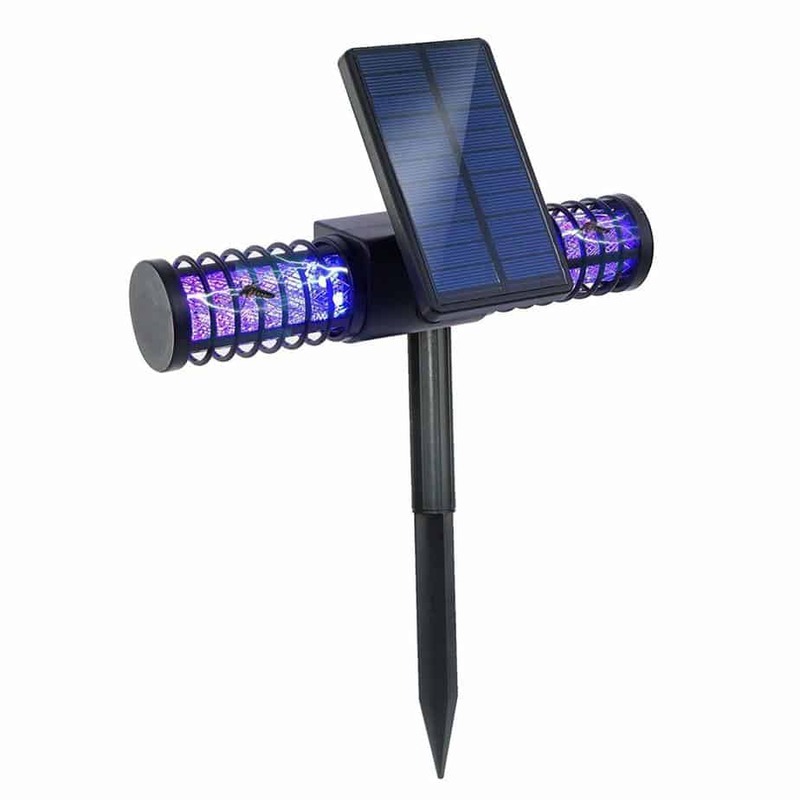 Battop Solar LED bug zapper is designed as a garden light. It is equipped with a solar panel that can store enough power to make the electric zapper and garden light on for 6 to 8 hours. It is also IP65 waterproof, making it ideal for outdoors. It is a T-shaped light with an adjustable solar panel in the middle and a pointed post for easy installation. Aside from the solar charging, you can use lithium-ion batteries and USB charging, especially during the cloudy and rainy days. This outdoor bug zappers has a lot of interesting features but has a lot of areas for improvement too. The design is a hit but misses on the power capacity. ​Keep your garden, lawn, patio and other outdoor living areas free from flying insects and bugs from dusk until dawn. Trapro Outdoor Bug Zapper is both a decorative LED lamp post and a bug zapper. 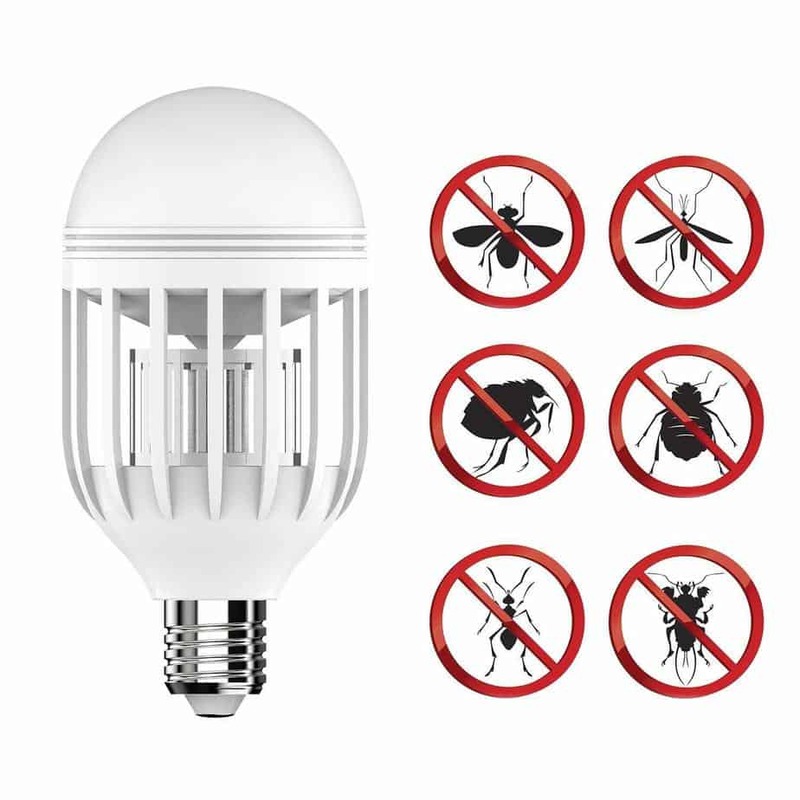 It comes with an LED light that can be turned on or off depending on your preference and a bug zapper that can work 24/7. The enclosure design makes it safe from accidental contact. It is installed as a fixed lighting on the ground and powered by electricity through an outlet or extension cord. It is ideal to plan your electricity sources and lamp post positions before you order this product. 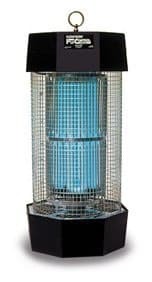 Trapro Outdoor Bug Zapper will surely be a great addition to any garden or lawn with its durable built and proven efficacy. However, the high price point can make prospects take a step back. ​The most accessible and convenient bug zapping solution for home use are probably the plug-in or socket bug zappers. It is a must-have for those who just want to get rid of minor insects and bug problems in their rooms. The zapping is quieter than the box-type and lantern-type ones. It is easy to clean and easy to transfer to other areas in the house. Plug-in bug zappers like Crioxen is a good additional reinforcement in the dark corners of your room. Always look for a value bundle for extra savings. Types of Bug Zappers ? ​1. Box-type. This style can be used upright on a flat surface or hung on the wall using the removable chain that comes with the package. It is popular for home use due to the wide coverage of insect zapping. It usually comes with two horizontal LED lights enclosed in a zapping grid with another layer of mesh grids for protection. This type requires space enough for either sides to attract and zap insects. ​2. Table-top. Bug zappers like this are for small rooms that require passive reinforcement against flying insects. Table-top variants are also the choice of those who prefer zero to low-noise bug zappers. These zappers are usually USB-powered and are rechargeable. ​3. Light bulb. Following the box-type zappers, light bulb bug zappers are one of the most popular ones. Without extra cost on electricity or need for additional sockets or extension cords, these zappers are space-savers and for universal use. It fits the standard light bulb sockets. ​4. Wal-mounted. Another bug zapper meant for smaller areas are the wall socket or wall-mounted type. You can simply plug it in without the need for too much planning or setup. This zapper covers a small area and will need frequent cleaning. Outdoor living spaces undoubtedly have more insects roaming around regardless of the season but mostly during summer. Although indoor bug zappers can be brought outdoors and can be powered through extension cords, it cannot be used during the wet season. The availability of outdoor and weatherproof bug zappers make a lot of difference in enjoying your patio, backyard and pool area without the disturbance of insects buzzing around. 1. Lantern. : It can add aesthetic appeal to your porch and walkways while resolving insect problems. 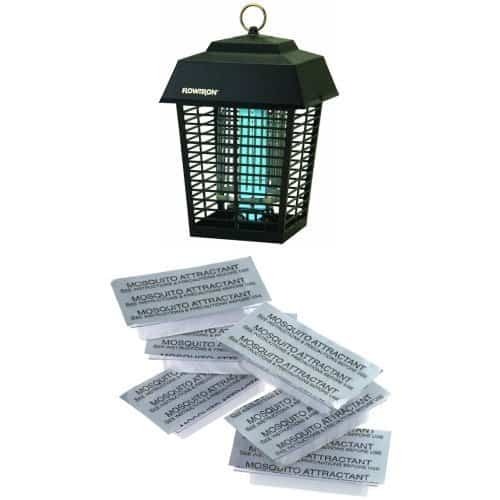 Although not waterproof, lantern bug zappers are designed using rust-proof and durable materials. It still can’t be rained on but offers versatility and easy transfer between indoor and outdoors. 2. Lamp-post. 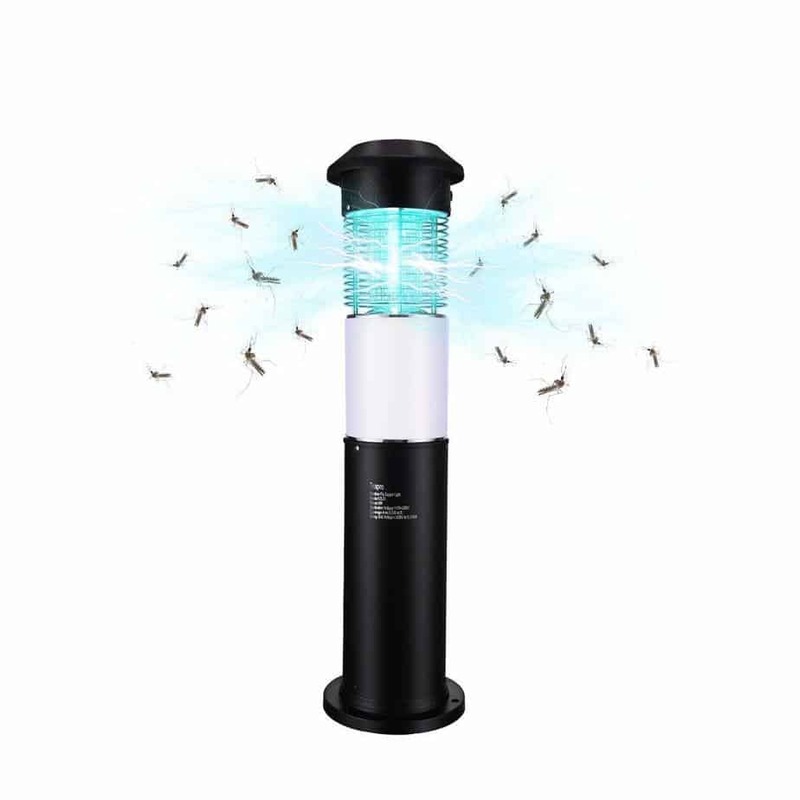 : These are the true-blue outdoor bug zappers that can be fixed on the ground, light up and give life in your backyard and garden while keeping it insect-free. These bug zappers still need to be plugged in and can be used as zappers, LED lights or both. 3. Solar-powered. : Solar-powered bug zappers come in different designs but aim to provide an overnight protection from bugs and flying insects by storing enough power from the sun. Just install it on the ground where the rays of the sun can get through the solar panel any time of the day to get maximum charge for the night. These are also designed to be installed as garden lights. 4. Portable : Insects can strike anywhere. If you love camping overnight or just a day tour trek, insect repellent lotions may not suffice. There are bug zappers that you can take with you on your next trip. 5. Handheld/swatter. : These bug zappers are the earliest versions in the portable category. It requires you to press a button while swinging the zapper where insects are visible. It comes in the shape of a tennis racket and it can incorporate fun in insect zapping. 6. Rechargeable. : Emergencies are inevitable. Will you be able to protect your family and yourself from insects during power outages or when you’re outdoors longer than expected? Rechargeable bug zappers are convenient and portable types you can take with you everywhere and can be powered by lithium-ion batteries or power banks. It may not be stunning in terms of design but function overrules form when it comes to bug zappers. It attracts insects in as fast as five minutes and it gets the job done. The value bundle also makes it hard to resist. This is probably the most hardworking zapper out there. In terms of size, it can cover 2,000 sq. ft. outdoor living spaces, farms or warehouses. The light is really attractive to insects and can lure and kill them immediately with its powerful killing grid which generates 5,600 volts. This is literally a bug zapper you can take with you everywhere. It is handy and portable and can be easily used as a tent light and bug zapper in one. No messy clean up before storing because you can simply put it under running water to wash the trapped insects. Dealing with insects and bugs is an all-year-round ordeal. Aside from keeping insects sprays handy and having a routine pest control in and out of your house, they can keep flying around from time to time. Bug zapper lights or electric bug zappers are great alternatives for insect control and extermination without the downtime. 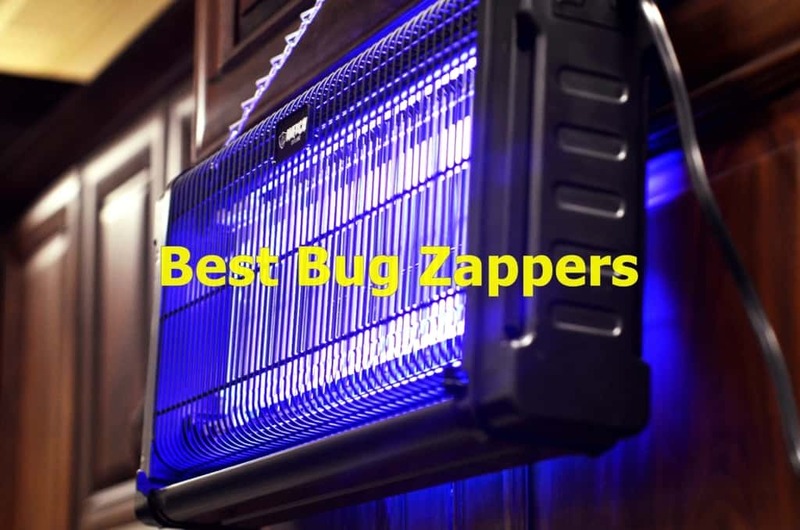 While other people might still be pessimistic in using one, it is very important to note that the ultraviolet light used in these bug zappers are proven harmless to humans and our pets. It is also helpful to read reviews and buying guides about bug zappers like this to get further information on how to best maximize use of every product. 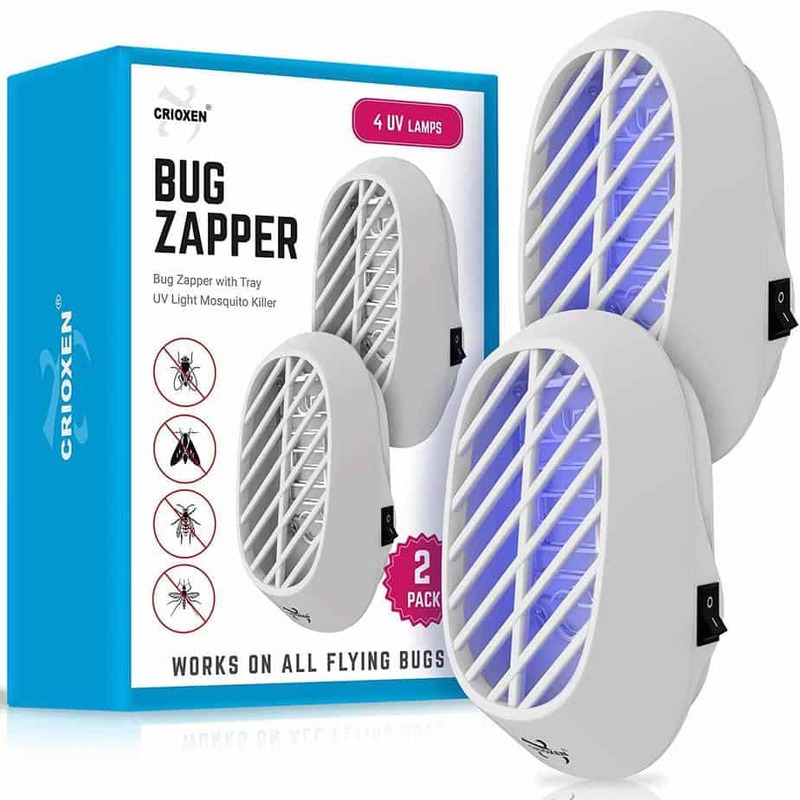 Bug zappers are truly a must-have for every household, whether for indoor, outdoor or travel use. Enjoy an insect and bug-free home now! Keep these enemies closer and zap them out.